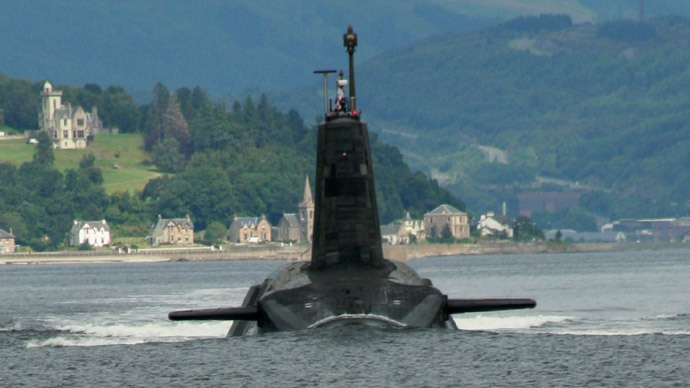 The future of Britain’s nuclear deterrent was debated in Parliament on Tuesday, hours after a Scottish opinion poll found nearly half of Scots oppose renewing the Trident program. Parliament’s debate on Trident comes weeks after the Ministry of Defence (MoD) published a report revealing the cost of the program’s “assessment phase” will increase by an additional £261 million this year. Renewal of Trident, which is based just 25 miles west of Glasgow, is expected to cost £20 billion. The cost of the overall program over the next 25 years, however, is estimated to be £80 billion. It was boycotted by most members of the Labour Party, which officially supports Trident renewal. The results, along with revelations of Trident’s rising costs, will boost SNP confidence, as the party pledges to oppose nuclear weapons ahead of May’s general election. Angus Robertson MP, a member of the SNP, opened the debate in the House of Commons. “Today’s debate is an opportunity to show there is opposition to Trident renewal in Westminster,” he said. Robertson emphasized the ethical case for scrapping nuclear weapons. “Each warhead [on Trident submarines] has an explosion eight times the power of the atomic bomb dropped on Hiroshima in 1945,” he said. In a press statement, the SNP criticized Labour’s boycott of the debate given the party’s support for austerity. “Labour’s refusal to take part in the debate on Trident comes less than one week after the party voted along with the Tories for a further £30 billion of austerity cuts,” the SNP said. “That Scottish Labour MPs support wasting another £100 billion on weapons of mass destruction while foodbank use is rocketing, and more and more children are being pushed into poverty, is simply indefensible,” they added. A handful of Labour MPs did attend the debate, however. Speaking to the Commons, rogue Labour MP Dame Joan Ruddock supported scrapping Trident. “The threats that were part of the Cold War scenario are very different from the threats we face today,” she said. “Real security lies in nuclear disarmament,” she added. Her comments echo those of current CND General Secretary Kate Hudson. “[Trident] is the wrong answer to the security challenges facing the UK. And when that wrong answer comes with a £100 billion price-tag, it’s no wonder it’s deeply unpopular with the British public,” Hudson said. “It’s time the government recognized the colossal waste of money that Trident constitutes, and committed instead to investing the money in health, jobs and education,” she added. “Whether we like it or not, there remain approximately 17,000 nuclear weapons globally,” he said. “We cannot gamble with our country’s national security, we have to plan for a major, direct nuclear threat to this country or to our NATO allies,” he added. Fallon cited Russia, North Korea and Iran as potential nuclear threats given their desire to build or maintain nuclear weapons programs. Parliament will vote on whether to upgrade Britain’s nuclear weapons program in 2016. A mass demonstration against replacing Trident will take place in London on Saturday, January 24. Organized by CND, the protest will begin at 12pm outside the Ministry of Defence on Horseguards Avenue.